Today I thought that I would let you in on a secret fetish of mine. Well, one of them anyway. And for those of you who do not know me, this is way beyond my comfort zone. I do not make a practice of talking about myself. But there is a certain event coming up that stirs my soul with restless excitement. Now before I let you in on this, you have to know that I’ve always been thought of as somewhat of a prissy girl. I love all things primping—the hair, the face, picking out the right clothes and the accessories; the jewelry, the shoes, the handbag, well just about everything that has to do with being a girl. And I did marry the right guy because he has always loved taking me shopping and buying me new clothes. Well, that is when the budget can afford it of course. Yet, it shocks people after they get to know me, especially since at first glance your impression of me might be a bit proper, or prissy. People are always taken back after I tell them this little tidbit of information. Let’s just say that I love to drink Champagne with the girls, but enjoy having a beer with the guys. Yes, the NHRA Winter Nationals are coming!!!! I know, I know, this sounds completely oxymoronic! Way out of character for the person that you’ve come to know. Well, all I can say is, there are times in our lives when we must bust the mold, and this is one of them. And in my dreams I see myself running down the quarter mile track in a Top Fuel Dragster. Okay girls, I don’t want to lose you here. Hang in there—I promise it will get better! I think I have some leftover Champagne from my interview with Diane Capri if you need some liquid fortification to get through this, although I think I’ve just peeked the attention of all the guys. LOL!! But why the drags? Why not Six Flags, or Disney World/Disneyland, or some other form of coaster rides for whimsical speed and entertainment? Well, why not? What else is there that compares to the speed and acceleration of an Extreme Motor Sport like Top Fuel? They don’t compare in speed. Let’s take the Dragster for instance. (My personal fav. )They are 25 feet long and weight in race ready at a little over a ton or just around 2250 pounds and can cover a quarter mile in 4.4 seconds at more than 330 mph. These computer-designed wonders have sleek profiles and wind-tunnel-tested rear wire foils that exert 5,000 pounds of down-force on the rear tires with minimal aerodynamic drag. Now that’s what I’m taking about. They’re powered by a 7,000 horsepower supercharged fuel-injected 500-cubic-inch adaptation of the famed Chrysler Hemi engine. (Remember the Cuda?) They can burn up to 15 gallons of nitromethane fuel during a single race and are constructed out of chromoly steel tubing and carbon-fiber composite. Just one Top Fuel Dragster has more horsepower than the first 4 rows at the Daytona 500! Uh oh, did I lose you girls? Hold on, we’ll be done here in roughly 4.4 seconds! I love it when they race at night. 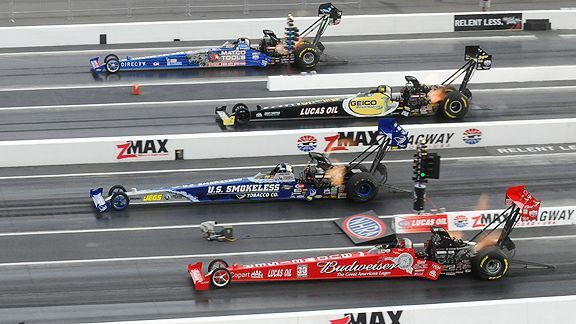 The competition soars as two Top Fuel dragsters meet in front of the starting line burning their rubber to promote traction sending a cloud of thick gray smoke to loom over the crowds. Amongst the dark of night their engines roar sputters out through the exhaust raw burning nitrous gas that with each push of the throttle fires off white hot flames into the air like pyromania. It’s time to cover our ears to protect them from the extreme whiny sound that can pierce our eardrums and there is a pounding sensation thuddering against our chest with each hit of the throttle. The dragsters crackle as they inch forward to the edge of the starting line. They rock with every vibration due to the power and force from their engines. We stand in anticipation of the green light on the Christmas tree—smoke and flames fill the sky at take-off, our necks turn to follow the rails as they fly down the track. Their Parachutes launch and in roughly four seconds the race is over. See, pretty cool huh? Gotcha going didn’t I? Girls, are you still with us? Hey this sport isn’t just for guys. There have been many women over the years that have made their presence known. Shirley “Cha Cha” Muldowney is considered the “First Lady of Drag Racing” and became the first and only woman to win a major racing championship and there have been others: Louise Smith, Janet Guthrie, Lyn St. James and Danica Patrick. So as a writer let your dreams run down the tracks of your imagination, let them soar like the undeniable force of the ever powerful Top Fuel Dragster. It may burn up a lot of fuel to come up with these inspiring stories that fill your minds with great suspense and thrilling excitement. But as you do be assured that I will be thinking about my next story as I sit on the sidelines in a crowded stand along the racetrack watching Top Fuel Dragsters run down the quarter mile of my own novel fantasies. So what do you think? What type of mystery are you working on? What things do you find thrilling and exciting? What kinds of ideas throttle your imagination? What lengths would you take to run down a dream? If you enjoyed this, I encourage you to run up to the top of the page and hit the follow button for future posts! This entry was posted in Blog Post and tagged Danica Patrick, Diane Capri, Disney World, Disneyland, Janet Guthrie, Karen McFarland, Louise Smith, Lyn St.. James, NHRA, Shirley Muldowney, Six Flags, Tom Cruise, Top Fuel Drags on February 8, 2012 by Karen. Who knew you were a speed-chaser?? Love it, Karen. Now every time I see a NASCAR or related commercial I’ll think of you. Vroom vroom! Thanks for the fun, fabulous post! Can’t wait for videos of you driving a dragster! lady, you have a wonderful way with words. I love race cars. I don’t go very often – there’s no track left in Calgary but one day, vegas here I come. thanks for sharing your passion. Yep, you totally lost me, but you had champagne, so it’s all good! I love that you have a secret racing side to you, keeps people guessing which is always good! My thrill seeking days are far behind me (and I’m okay with that). What gives me a good shot of adrenaline now is planning vacations to far off places. Enjoy your races and I’ll have a beer with you to celebrate your win! I’ve said it before and I’ll say it again, you are crazy! I get the jitters on a fairground ride never mind a drag race. Your description is fabulous. Hmm, anyone might think you’re a writer!!! Prudence MacLeod recently posted..Moira, Book #4 in the St. John’s series. Thanks Prudence! See, it is the sensation of the acceleration that Rocks. I am 100% behind women’s involvement in racing, but oh god, there is no way I could be behind the wheel. Just the thought of it makes my palms sweaty in a BAD way. My dreams seem to come from much quieter endeavors, like sitting outside on a sunny day, lol. Did you really Lena? That’s cool. I’m so glad to hear you say that. Thank you. What a compliment. OK, this falls under ‘don’t judge a book by its cover’. lol. I’d never have guessed you as a speed demon. You and Fabio are making the rest of us look like wimps today. Enjoy the races! LOL Mike! You clever man. I love that. And no, we can’t always know who people are from their outside appearance. And I would never think of you as someone who is a wimp. Takes guts to write a book and then put it out there for the whole world to see. So you a wimp? I think not. I agree with Karen! It takes lots of courage to put yourself and your book out there. Wow, between you and Fabio, this WANA group really rocks! Speed is always exciting, although I’m a terrible driver and could never imagine myself driving a race car. That’s one fantasy I’ll just have to keep on the page. LOVE it Karen! I am a HUGE NASCAR fan so I get your need for speed and these bad boys deliver in STYLE! Woot woot!! Ahhh, the smell of burnt rubber and racing fuel! What would I do? A couple years ago started a novel featuring a 2010 Camaro. Going to finish that one this year – my car enthusiast friends are waiting for it! Fun post – enjoy the races!